The UK Government is being urged to reconsider its current budget and tax plans, and opt to deliver greater spending cuts while reducing the impact of tax hikes. On June 11th the Confederation of British Industry (CBI), the UK’s largest business group, sent an open letter to the George Osborne, Chancellor of the Exchequer, urging a reevaluation of the Government’s intentions for the upcoming budget announcement. 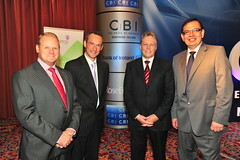 The CBI stated that the nation’s budget deficit should be controlled through spending cuts and not raised taxes. According to the CBI, a radical reform needs to be carried out on public services to deliver far greater levels of efficiency, with little cost to national infrastructure. Ultimately, for every GBP 1 of tax increases the Government instates, there should GBP 4 cut from national expenditures. John Cridland, CBI Deputy Director-General, elaborated on the CBI’s view for the upcoming Budget, saying “This needs to be a bold and ambitious Budget, with a credible pathway for restoring sound public finances and a convincing narrative for growth.” The CBI stated that in evaluating the national tax balance and public spending, the Government needs carry out a root-and-branch examination of all current spending needs and infrastructures. In regards to taxation, several already announced changes were brought into question. The CBI deems the plans for the national tax treatment of pensions as unnecessarily complex, leading to higher compliance costs. Additionally, the CBI praises the current form of the research and development tax-credits and urges the Government to leave it unchanged. The CBI is especially concerned with reforms to the Capital Gains Tax (CGT) system. The tax should be structured to minimize the impact it will have on long-term investments, and business start-ups.